January 14, 2019 — The U.S. Food and Drug Administration is warning pet owners not to feed one specific lot of A+ Answers Straight Beef Formula for Dogs after the Nebraska Department of Agriculture discovered Salmonella in the food. The FDA is issuing this warning because the affected product represents a serious threat to human and animal health and is adulterated under the Federal Food, Drug, and Cosmetic Act. The FDA is still working with Lystn to gather comprehensive distribution information and is issuing this warning to alert consumers about this public health risk. People infected with Salmonella can develop diarrhea, fever and abdominal cramps. Most people recover without treatment, but in some people, the diarrhea may be so severe that they need to be hospitalized. Pets do not always display symptoms when infected with Salmonella, but signs can include vomiting, diarrhea (which may be bloody), fever, loss of appetite and/or decreased activity level. If your pet has these symptoms, consult a veterinarian promptly. Pet foods contaminated with pathogens such as Salmonella are of particular public health importance because they can affect both human and animal health. Pets can get sick from Salmonella, and may also be carriers of the bacteria and pass it onto their human companions without appearing to be ill.
Once Salmonella gets established in the pet’s gastrointestinal tract, the animal can shed the bacteria when it has a bowel movement, and the contamination will continue to spread. Federal law requires all pet food to be free of pathogens, including Salmonella. Pet food manufacturers must effectively manage sourcing of ingredients, processing and packing to control pathogens. Without an effective control, such as cooking, raw pet food is more likely than other types of pet food to contain pathogens such as Salmonella. Pet owners who choose to feed raw pet food should be aware of the risks associated with these products. 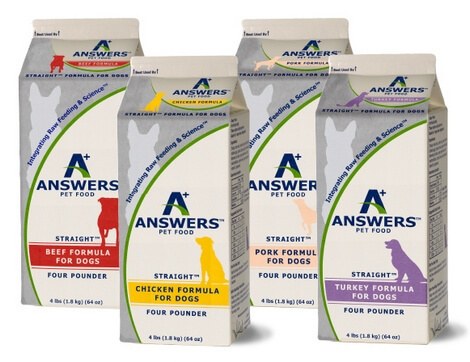 Answers Pet Food wants readers to know that the FDA’s post is not a product recall. Click here to read company’s response to the FDA warning. Pet owners who have this lot of A+ Answers Straight Beef Formula for Dogs should discard it in a secure container where other animals, including wildlife, cannot access it. Consumers who have had this product in their homes should clean refrigerators/freezers where the food was stored and clean and disinfect all bowls, utensils, food prep surfaces, pet bedding, toys, floors, and any other surfaces that the food or pet may have had contact with.